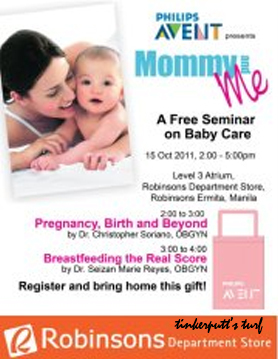 I registered at the Philips (AVENT) Mommy & Me Event to be held at the Robinson's Ermita Department Store Atrium on October 15,2011. I am specifically interested in the Breastfeeding topic as I am currently exclusively breastfeeding Jabe for almost 4 and a half months now. I am very pleased to know that I have two reserved seats for me and my husband, thanks for me being quite an active discussion board participant. I am also excited to finally meet some of the mommies from the discussion board. 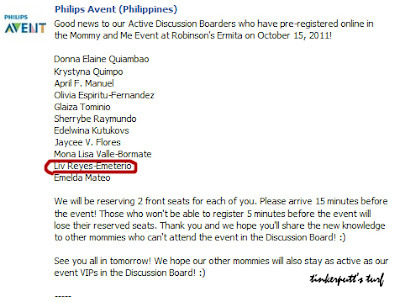 It states that I need to 5 minutes before the start of the event or else I will lose my reserved seats, good thing that day is also Jabe's vaccine day at Manila Doctors Hospital so we will be able to go to Robinsons Ermita early. Thanks Avent! See you on the Saturday! Happy 5th Month Birthday Mi Angel JABE! Momme Luxe Planner + Mommy Fleur Giveaway!